Greg Siskind is an immigration lawyer who launched one of the very first law-firm websites and the first law blog, and the author of the Lawyers Guide to Marketing on the Internet. This On The Road report from ABA Annual Meeting 2017 addresses the different aspects of immigration and what they mean for the US society and economy. 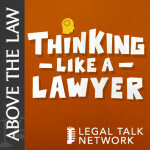 The evolution of law firm websites, online marketing, and excitement over the Lawyerist Podcast joining Legal Talk Network.